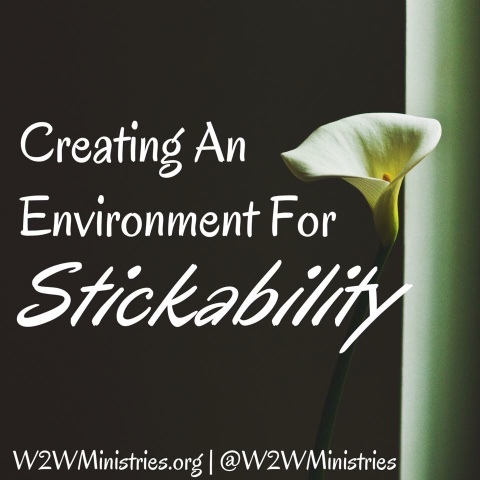 There is a constant dialogue between pastors about the "stickability" that is or isn't taking place within those that are ministered to each week. Especially with children, it is never blatantly obvious whether they are absorbing truths that are being taught each week in the hour given to guide the spiritual direction that will effect that child for eternity. And admittedly so, as a Children's Pastor, the joining of forces between leaders and parents to coordinate efforts is challenging, at best. So often, in these times, parents rely on the church to lead their children on things spiritual, without bringing it into the home, to fight for time and attention against dance practices, sports, "activities", and a myriad of other things that seem to overwhelm the schedules of families. And, little by little, the spiritual well-being of our children diminishes. If this scenario sounds familiar, you are not alone. But, there is something you can do! You can utilize the resources of your pastor or leaders in the church, along with a concentrated effort to reprioritize your schedule, and help reignite a spiritual fire within your family. Where can you start? Here are a few ideas to lead you on your journey. 1. Consider where you are in your spiritual journey. The first place to strengthen your spiritual influence in your children's lives to to evaluate your own current relationship with God. Are you making God a priority in your life or are you just adding him in wherever there is room in your busy life to slip into those pearly gates (Heaven)? Do you take time to refill your own spiritual tank every day? Are you obedient to what He speaks to you? Do you hear the voice of God? If it's been a while, maybe it's time to go back to the beginning. When we asked Christ to be Lord of our lives that wasn't just a saying. It meant that we died to ourselves and live only in Christ. We died to our old sinful nature and now are vessels of the Living God, that lives through us. What example of a Christian are you? 2. Take your kids to church. And stay with them. I know there are plenty of arguments out there nowadays whether going to church makes you a Christian. You're right, it doesn't. But God created us to be relational beings. The church was created by God, through Jesus, to bring glory to the Father. We need each other, the Body of Christ, flaws and all, to grow each other up. Your child needs to see you worshipping and humbled before God. They need to see you deal with that irritating person that just gets on your nerves. They need to see that you still love those people despite their flaws. They need to see that learning about God and His Word is a priority above all else. It is the wellspring of your very soul. They need to see that God speaks to us through the Body. They need to see you in church with them. 3. Be involved in what your children are learning in church. Ask your kids what they learned in church. Do they have questions? What was God speaking to their hearts? Have they heard God's voice talking to them? Go over memory verses and explain what they mean. Post the scriptures on your frig and help them memorize the Word. In our church, we send home or mail postcards to reiterate what the lesson was about that day. There are questions that create talking points on how the Bible is relevant even to a child's life. It is my prayer that the "sermons" that I put my heart and prayers into each week do not go in one ear and out the other, but that each child applies it to their lives and it makes them stronger in their faith. As a parent, you can make a lesson become that much more real to their lives if you talk about it outside of church walls. 4. Become involved with other Christians. We all need each other. Not just on Sunday mornings as we slip in and out of the church unnoticed, not getting involved with anything outside of that. Be an example to your children by attending events outside of church. Make friends with those you attend church with. Volunteer to help in the many ministries in the church. Let your children see your work and get them involved in helping also. Teach them that we are the preverbal hands and feet of Jesus. Without you, the world will never know His love for them. So, make it a priority in your schedule to love and be loved. There is nothing better than an example to our children.